Procter & Gamble Dawn® Professional™ Liquid Detergent, 38 Oz. Home | Home And Garden | Cleaning Supplies | Procter & Gamble Dawn® Professional™ Liquid Detergent, 38 Oz. Home | Facility Safety | Janitorial Supplies / Food Service | Procter & Gamble Dawn® Professional™ Liquid Detergent, 38 Oz. Dawn liquid detergent activates on contact to quickly and easily remove the toughest grease. Mild on your hands — Dawn detergent dishwashing liquid will not dry out your skin. 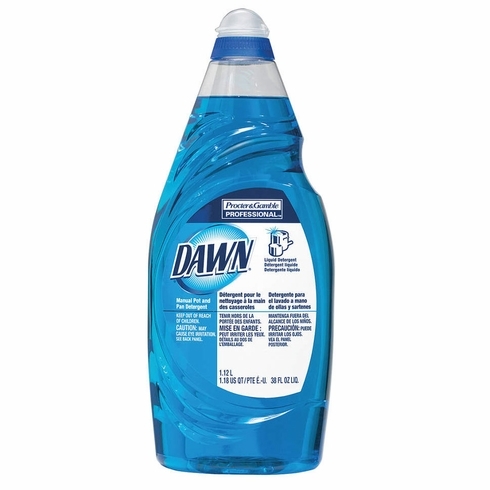 Dawn 38 oz liquid dishwashing detergent performs well no matter what kind of dishes you have. Liquid offers effective washing of dishes using less detergent. Dawn dishwashing liquid activates on contact, attacking grease, grime, and stubborn baked-on food so that your dishes get clean with minimal effort. You won't have to worry about greasy residues or ugly stains ruining your favorite dishes. The concentrated formula of Dawn dishwashing liquid allows you to easily wash more dishes using less detergent, saving you money. It also allows you to wash larger loads at one time, reducing the number of sink changes needed while you clean up. This professional-grade Dawn dishwashing liquid is designed specifically for use in restaurants and other locations that require extra-strength cleaning power. It cleans tough stains and grease with maximum efficiency, leaving your pots and pans sparkling clean and ready for another day.